What will happen to on-street parking on University Avenue? University Avenue will retain 175 of its 1,150 on-street parking spaces after 675 spots are removed to make way for mandatory elements such as the LRT stations, 250 are eliminated to accommodate non-signalized pedestrian crossings, 40 are removed to provide secondary station access, 20 are lost to make room for three-car station platforms and 40 are eliminated to allow space for minimizing traffic lane transitions. Project studies show 560 on-street parking spaces are available on north-south cross streets within a block of the corridor and 15,300 off-street parking spaces are available within one block of University Avenue. A 2006 city of St. Paul study found 25,000 spaces in private lots within one-quarter mile of the LRT stations. One of my projects this winter has been to add detail to OpenStreetMap along the Central Corridor, and I’ve had a bit of morbid fascination with the parking lots spread all along the route. Anyone who’s visited University Avenue has seen the massive lots at the Midway Shopping Center and other retail districts adjacent to the street. But small-scale parking has managed to consume huge amounts of land as well (and a lot of it has been around for a very long time). The image at the top of this article shows the most egregious example I’ve found of small-scale parking spinning out of control, located along University northwest of the intersection with Raymond Avenue. Depending on how detailed you want to be, there are 15 to 20 buildings on the block. I count 20 curb cuts for driveways and alleys. And thirteen parking lots, give or take. This absurd little chunk of land in Saint Paul seems to document a transitional period in history. 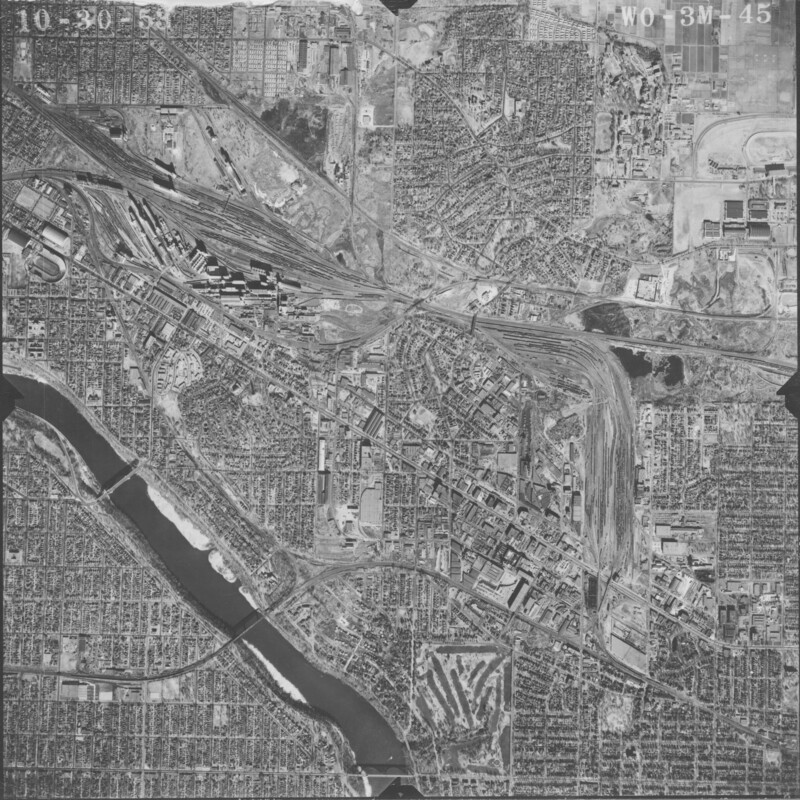 There’s aerial photography for the block dating back to 1923—a time when railroad and streetcar ridership was peaking in the Twin Cities and across the country. Back then, the Raymond Avenue side was mostly filled in, but the block was otherwise fairly sparse. By 1953, the block became as built-up as it was ever going to get, and already had about eight parking lots. Since then, it seems that two buildings have been demolished and two have been added. Parking expanded into most of the green space on the block and also into the spaces left by the demolished buildings. However, I’m a bit surprised by this block now that I’ve dug into its history a bit. Compared to the surrounding neighborhood, this actually seems to be an island of calm in an undulating sea of transition. Several nearby blocks have been completely destroyed by highway construction since 1953, and others have completely changed due to urban renewal efforts. I had expected to find that a bunch of buildings had been destroyed to make way for parking, but that only seems to be a minor culprit in this case. With my knowledge of what happened to downtown Minneapolis as urban renewal took hold, I often look at fields of asphalt in the core of the Twin Cities and think that they were once buildings, but that’s not always the way things happened. Parking has tended to consume open, undeveloped space just as much (if not more). I’ve gained a little bit of nostalgia for this little piece of the city because it has actually remained relatively intact, though I think it’s best to divorce myself from that sensation. Clearly, a lot more value could be extracted from this land if some of these individual enclaves of parking got merged together and were shared more readily among neighboring businesses. There’s an economy of scale to be found by from combining parking lots together—the asphalt could be used much more efficiently. Consolidated parking would also reduce the number of driveways, leading to improved pedestrian experience, more on-street parking, and open land that could be developed. Few other blocks along the Central Corridor are quite this crazy, but there are still countless opportunities along University Avenue and elsewhere in the Twin Cities to redevelop asphalt “grayfields” into new homes and businesses. Rather than holding tight to as many parking spaces as they can get, existing property owners should look at those empty lots and try to imagine what could be in that space instead. Is Minneapolis Ready for Form-Based Codes? Excellent and thoughtful piece. I love the multi-block desire paths in that '23 photo. You are right that in a lot of the outlying areas, today's parking lots were merely yesterday's vacant lots, but the further in you go, the more tear-downs are represented. Good catch! I'm just curious though, does anyone know if [in re-developing] these parking lots, would pavers or some slightly permeable surface work in MN? I always loved how the Europeans use block pavers to make parking lots, but would frost heaving make that unpractical in MN? Anything is better than acres of blacktop. I'd love to see pavers get used more often. Parking lots are a de facto type of shared space, but they're rarely designed to acknowledge that fact. I think using pavers — at least near building entrances where the most people are moving around — would allow for a much greater flexibility in the use of space, making it easier to transform an area into seating for a restaurant in warmer months, or a small marketplace on weekends, etc. Pavers cost more to install initially, but I'm not so sure about how the maintenance works out — I suspect it requires maintenance on a more regular basis, but sometimes you just need to re-seat what's already there. But even for property owners who are wary of pavers, you can get partway there by using colored and patterned concrete pavement — something that's popping up quite a bit at intersections and along sidewalks for the Central Corridor LRT line. Mn/DOT has done some research on pervious concrete pavement up at their Mn/ROAD facility near Monticello. While pervious pavement tends to degrade more rapidly under laboratory conditions, they noticed that their pervious pavement stayed warmer and experienced fewer freeze-thaw cycles than regular pavement. I haven't found any final conclusions yet, but it sounds like the reduced number of freeze cycles could mean that the pavement could last just as long even though it can't technically handle as many freezing cycles as regular concrete. Last time I checked, Oslo, Stockholm and Helsinki were in Europe. Maybe have a look there. Or try Quebec City. See what they do. I am looking on the Googles™ at Helsinki, following the tram routes to see. So far I have only found 3 parking lots – one next to the velodrome, one next to a stadium, and one that is actually a market square that is used for parking when there is no market. It is covered in cobblestones – thick, European, fanning-out cobblestones. I'll keep looking, but I don't think this is a case where we can blame the weather. I was doing some research on Barcelona last week for a class project. I found a parking lot there, but that appears to have been a special circumstance, otherwise, the reason they don't use so much asphalt for their parking lots in Europe seems to be because they don't have them (which is not the same as saying they don't have parking). As far as consolidating parking, it works for MOA, so why not shopping areas on University. I mean, the Apple™ Store doesn't have its own parking spaces. There is none of this, "if your going here, you can park in these spots after this time but before this time" crap. Starbucks does not need a 5 minute space in the rotunda right in front of their café. H&M can't rent out the store space next to theirs so their customers can park there. Hell no. The Mall is going to use all of that frontage because it is valuable, and they are going to charge full price. But if you build a parking lot on University instead of a building, your taxes are reduced. You are rewarded for destroying the street frontage, and punished if you do something that adds value to the street. Thanks for the link — There it is! Right on page 3. It doesn't look like that workshop plan put much effort into shrinking the overall number of spaces, however. I may look into that a bit more, though. but… but… there's not ENOUGH parking! its the #1 concern of the public. we need more parking. where can i park my car? help! I wonder if anyone has told them about the light rail that's going in on University. That might change their minds about that ridiculous parking glut. I agree that the drama about "losing all the parking" on University has been greatly exaggerated. Your mapping made the case well. While I am usually the loudest voice trying to eliminate parking, or at least managing it better, I do bemoan the loss of on-street parking, which can greatly add to the pedestrian experience and add needed quick-turnaround parking of stores (if metered). I do hope that on-street parking can be brought back at some point, and then we could add a bike lane and lose two driving lanes. And then of course we could redevelop a bunch of the parking lots.